VesselsValue (VV), online valuation provider, is launching daily valuations for Mobile Offshore Drilling Units (MODUs). This new vessel type is part of VesselsValue recent push into the Offshore space: last May VV launched daily updated market and demolition values for 6,500+ Offshore Support Vessels (AHTs, AHTSs and PSVs). The new vessel types, which are now available on the VV website, comprise of 1,020 individual MODUs (including Drillships, Semisubmersibles and Jackups), and can be presented via company fleets and portfolios. To arrive at daily valuations, VesselsValue uses a complex algorithm which considers the full specifications of the vessel (age, size, ship type, features) as well as the recent spot rates, second hand sales, newbuilding prices, oil pricing and other market indicators. This data is made available for VV clients through the VV Deals database. To complement the online valuation service, VV is increasing the coverage of the VV@ AIS Deep Sea Mapping of the OSV and MODU fleet to include mapping of Energy assets and Offshore infrastructure (GIS). 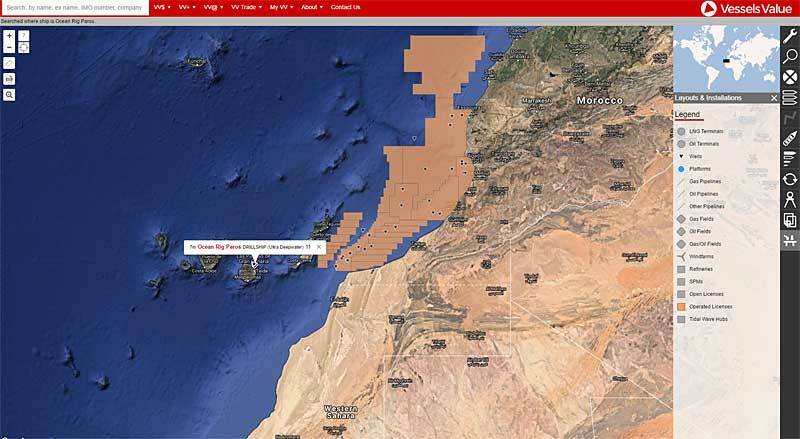 Clients can sign up for instant email alerts (Zone Alerts) when tracked vessels enter specific field boundaries or within a specified distance of Offshore Installations to look for new developments or new wells. The next projects for the Offshore team include an automated Discount Cash Flow Model for offshore vessels as well as Market Values for Semi-Submersibles, Ocean Going Tugs and FSVs. MODU values have suffered in a similar way to the OSV sector. This is due to the position in the industry chain of MODUs in relation to OSVs. When there are limited opportunities, poor utilisation and negative outlook for MODUs, this is directly felt by the OSV sector. We have seen the values fall substantially- the current fleet value for MODUs currently stands at USD 62.5 billion- but it seems the worst is yet to come. 9.7% of the total Jack Up fleet is set to be delivered this year, along with 7.2% of the SemiSub fleet and 7.9% of the Drillship fleet compounding the excess supply. It is expected that we will see significant slippage. The difficulty with valuing Ultra Deep Water floaters is the significant lack of data points. However, the most recent two provide an interesting view of the floater market. Cerrado (10000 ft rated water depth, 2011, Samsung Heavy Industries) (now Ocean Rig Paros) was famously bought by international offshore drilling contractor Ocean Rig in April last year at auction for USD 65 million, where they were the sole bidder. The previous owners, Schahin Group, filed for bankruptcy in April 2015 after finding themselves in billions of dollars’ worth of debt. The expected price was USD c. 200-250 million, but the price achieved represented the dire second hand market for UDW Drilling units, as well as the rest of the offshore sector. Deepsea Metro II (10000 ft rated water depth, 2011, Hyundai Heavy Industries) was sold a month previously for USD 210 million, however, this was from the bank in control to a trust affiliated with the bank. Ocean Rig Paros was then cold stacked and is currently located in Las Palmas (as per mapping service VV@). What is important to note now is that a vessel of this size and technology level has never been reactivated from cold stack. Costs for this (if possible) range from USD 15-100 million, quite simply, no one knows. VesselsValue today has the Ocean Rig Paros at USD 173 million, however it is worth noting that this is assumed working. Values have taken a huge hit since the aforementioned sales, they were around USD 250 million for UDW drillships, and now are USD c. 170 million, representing a 32% drop since March 2015.